The Victorian alpine resort’s award-winning children’s Snowsports School will reveal an exciting new look this season in collaboration with leading children’s entertainment brand, Nickelodeon. Nickelodeon will take over the theming and design of Falls Creek’s children’s Snowsports School across the sixteen week season which will officially kick off from 9 June 2018. Falls Creek Ski Lifts’ General Manager Sharon Raguse said “We’re extremely excited to be teaming up with the powerhouse children’s entertainment brand, Nickelodeon, for the second year in a row to showcase unforgettable experiences that will see families creating lasting memories in the snow. We’re thrilled that Nickelodeon has chosen to join us in this brand collaboration, creating some magic at Victoria’s largest alpine resort, Falls Creek”. 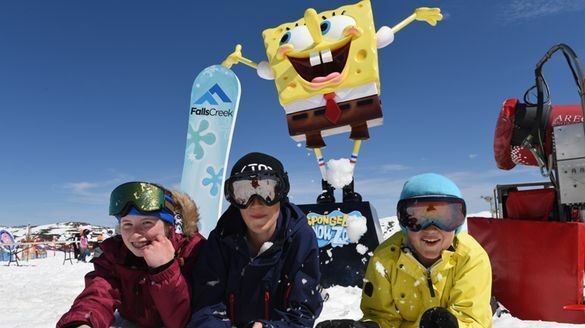 Ben Cox, General Manager and Vice President of Nickelodeon Australia and New Zealand added, “Working closely with Australia’s family-favourite alpine destination Falls Creek provides an exciting new opportunity for families to interact with Nickelodeon characters they know and love. We’re delighted to bring the partnership to life and as Falls Creek’s family entertainment partner, we’re sure this brand new offering will give parents and children of all ages yet another reason to visit the resort”. Falls Creek Ski Lifts is owned by global attraction operator, Merlin Entertainments Group, and runs the daily operations of Falls Creek Alpine Resort. The Victorian ski resort is Australia’s premier all seasons resort and is widely regarded as the country’s most loved family ski destination. Note to editors: MERLIN ENTERTAINMENTS plc is is a global leader in location based, family entertainment. As Europe’s Number 1 and the world’s secondlargest visitor attraction operator, Merlin now operates over 120 attractions, 18 hotels and 6 holiday villages in 25 countries and across 4 continents. The company aims to deliver memorable experiences to more than 65 million visitors worldwide, through its iconic global and local brands, and the commitment and passion of its c.29,000 employees (peak season). About Nickelodeon: Nickelodeon, now in its 39th year globally and 23rd year in Australia, is a globally recognised and widely distributed multimedia entertainment brand for kids and family. It has built a diverse, global business by putting kids first in everything it does. The company includes both locally produced and global television programming plus consumer products, digital applications, theme parks, recreation, books and feature films.